We arrived at this nice park about 2:00 pm after the run through Calgary. The Trans Canada highway goes through the center of Calgary, it is a bit of a hassle fighting the stop lights (but not as bad as Edmonton). They are working on improving the roadway, but it will remain a hassle with the traffic lights even after the improvement. There did not seem to be a city by-pass highway that we could take from the west to the east. 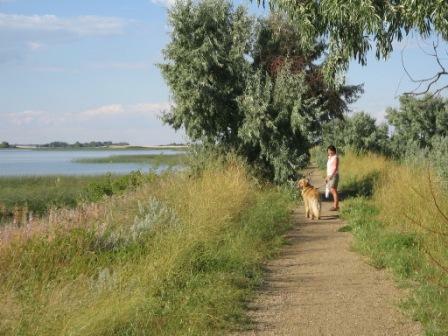 Kinbrook Island is a park that was developed by the Kinsmen back in the 1950's, then it became a provincial park. The Kinsmen still play an active role, making yearly improvements to the facility. 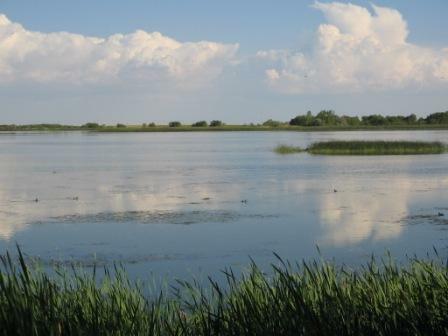 It is a great spot for families, the park is on a lake, lots of opportunities exist for water recreation. As through most of Alberta, the area is booming because of oil, we saw a billboard outside a restaurant advertising for a cook at $16.20 per hour. Apparently, Tim Horton's in some communities are paying these rates for counter staff in order to keep the facilities open! 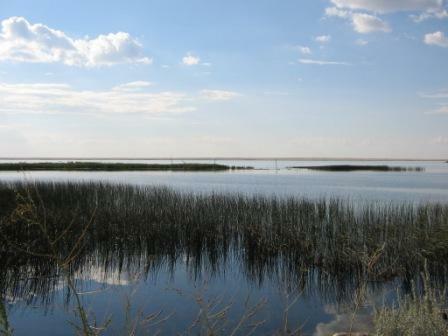 This is the view of the marsh side of the lake, lots of ducks and other waterfoul. Apparently there are pelicans there as well, we didn't see them on our walk. The ducks are havving a great time! We got into this provincial park located between Canmore and the exit to Kananskis just after noon today, and Suzette looked after the laundry (we can go about 2 weeks between washes). 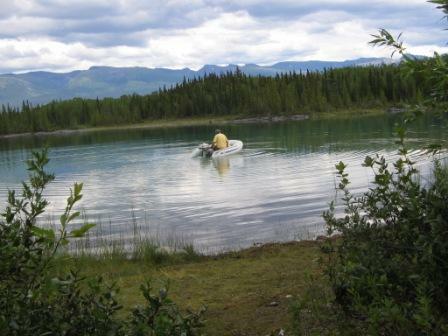 We don't have pictures, but it is a good one night stop (we have 15 amp power and water) and there is a clear shot to the satellite with a signal strength of about 60. The forecast for Calgary calls for rain today, we have had some short rain and thunder showers, but we are betting that we have a fire tonight. 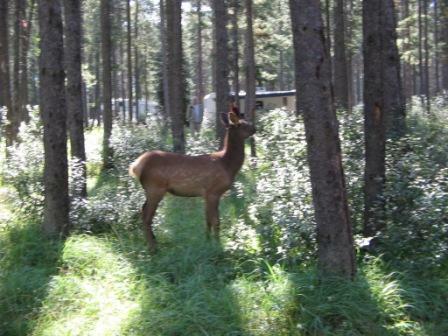 Before we left Banff NP this morning, Suzette got some great shots of Mule Deer grazing in the campground (see below). Tomorrow, we are headed for Brooks then Cyprus Hills after that. 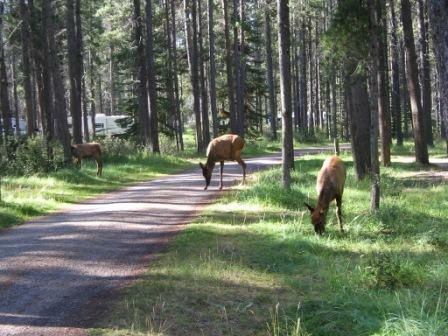 We made it over to Banff National Park about 3:00 pm this afternoon, and we are camped in Tunnel Mountain Trailer Court. We reserved the site for one night, but decided to spend a second night here and check out Banff. 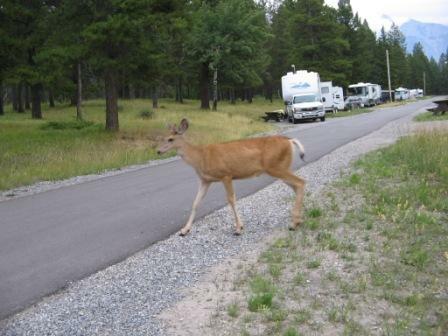 Suzette is out taking pictures of the campground, these will be posted later. We are adjusting to losing one hour coming over from BC, however, this morning we slept in to 7:30 (our bodies said that it was really 6:30 am). It helped that this is good sleeping weather (it was 6C in Jasper this morning and 2C in Banff!). This is the view from the campsite! 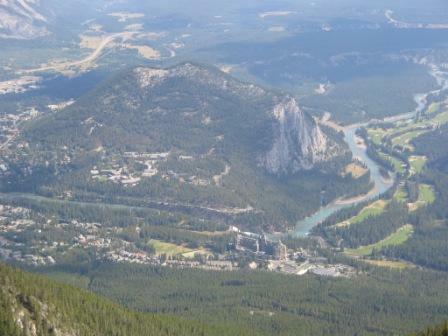 On Tuesday morning, we had an opportunity to take the gondola ride to Sulpher Mountain. It was a great ride and the views were fantastic, much better than the ride in Jasper. 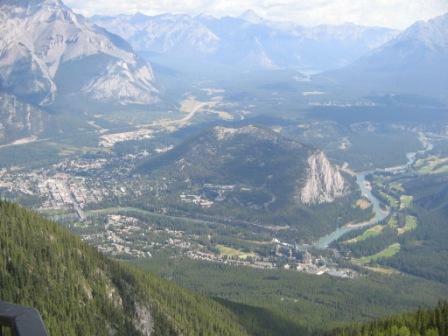 Another view of Banff, the pictures do not do justice to the magnificent view. It had rained last night, so there is a little bit of mist around. We had 2 great days in Jasper. The first night we got a non-sericed site in Whistlers campground, it was kind of overused (like Pinery after the Labour Day weekend), the second night in a full service site in the same campground. 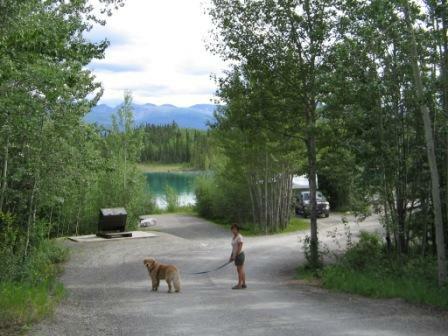 After the standard set by BC parks (see below), Jasper was a disappointment, it seems that the practice in BC and the NWT of using private campground operators results in a better quality of cleanliness and service. 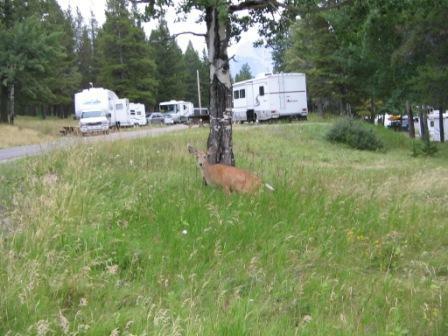 In Jasper, the campsites were not cleaned between uses, this seems to make the difference. 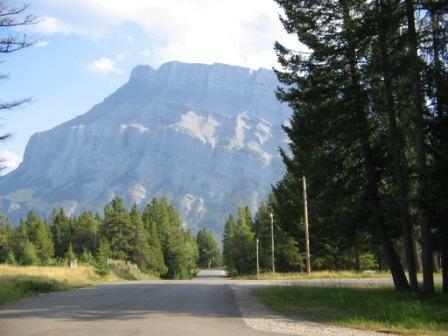 In addition, the roads in the Jasper campground were narrow and potholed, and the Icefields Parkway was not in great shape either. 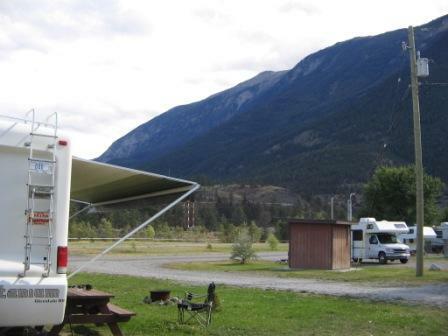 Considering that the camping charges including entry fees in the NP's are significantly higher than in BC parks, I wonder if the funds are going into Canada's "general revenue" slush fund instead of improving the parks. 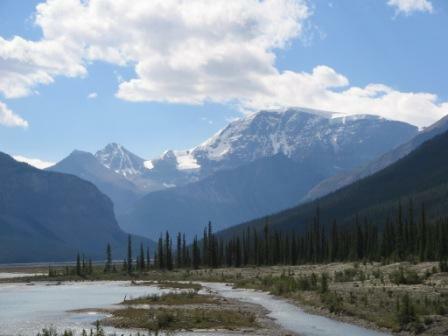 This is a view of the mountains between Banff and Jasper (I believe the river is the Athabaska river). 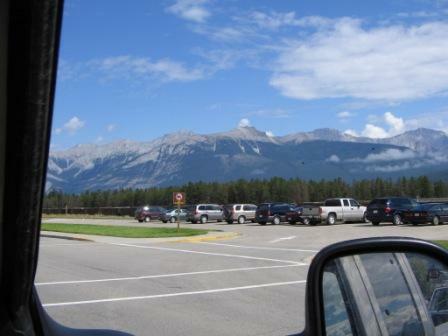 The Jasper townsite was nice to visit, they have a train station with a view as well! Last time we were here in 1992, Elk were all over the campsite, this time they showed up to graze early in the morning (they actually were there overnight as well). Over the next day or so, I will update the site with pictures from other parks we visited in BC. A provincial park for a change! We made it up here by the Cocualla (sp??) Highway, and passed an active forest fire on the way! 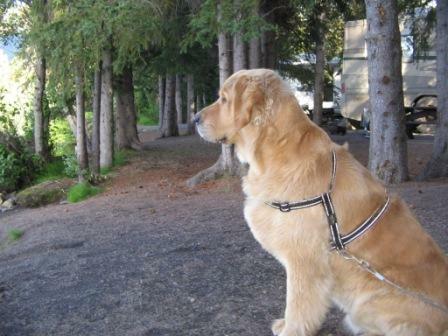 Our site overlooks the lake from a distance. In spite of the forest fire about 100 km. from here, there are no campfire bans, we are having the first campfire in about a week! 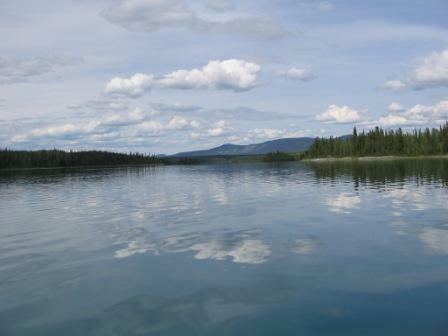 Tomorrow we head up towards Wells Gray Provincial Park and towards Jasper, if we get a sattelite friendly campsite, we will be back on-line. 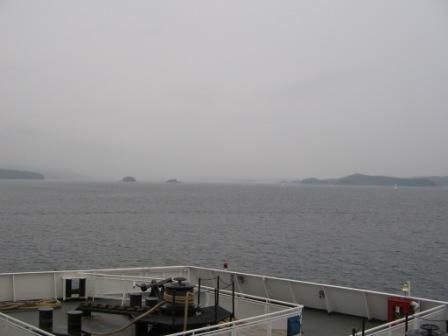 We took the ferry from Swartz Bay on the island to Twassen on the mainland, navigated through Vancouver (got off-track once!) 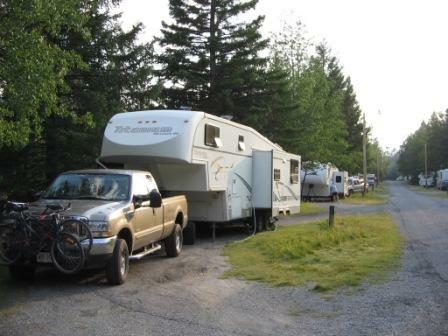 then parked at a private campground near Hope BC. 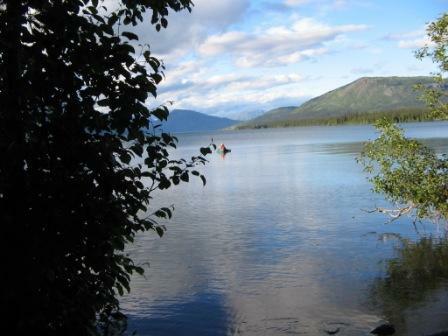 The campground was a good one night stop, but we look forward to a provincial park again after a week of private parks. 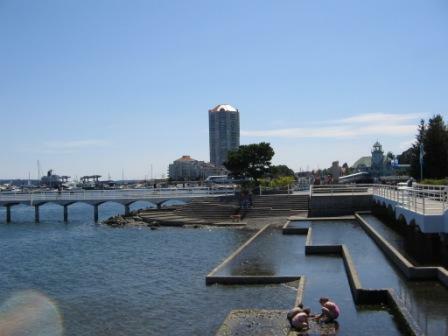 We made a short run from Nanaimo to just outside Victoria. We had wanted to get into a provincial park. 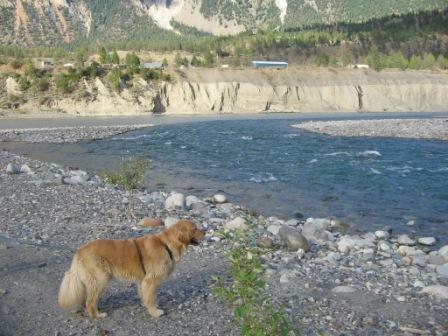 We tried one north of here, but it was unsuitable for RV's although the provincial camping guide did not indicate this. 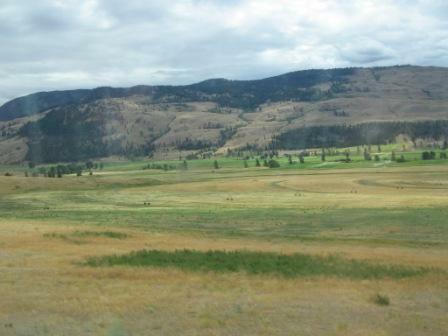 On the way back to the Trans-Canada highway, we got lost. We tried to get into another one just south of here, but gave up after having to make a U-turn in the picnic area!. The Trans Canada highway here is such that you can't make left turns, we had to go a to "U-turn" cutout, then tail back to the KOA. STRESSFULL! The above combined with holiday Monday traffic heading into Victoria and the ferry resulted in my decision to stay in the KOA, not quite the campsite version of the no-tell-motel, but not as nice as the parks we've stayed at. The good news is that we have a wireless internet connection to update the web site (from our RV) and 30 amps to utilize the A/C (it's 27 or so outside). 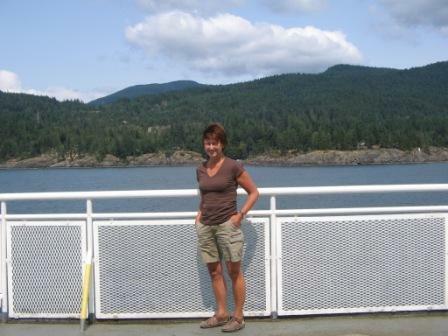 We made it over to Vancouver Island on Wednesday, a 2 hour ferry ride from the mainland. 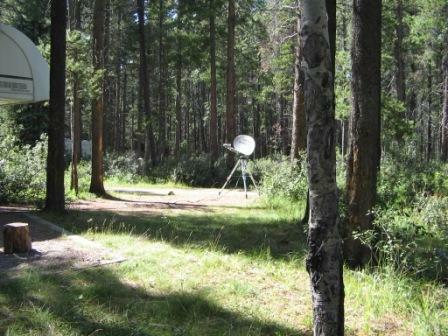 I'm still having problems with the satellite dish finding a clear shot through the trees, so I'm updating the website with a wireless connection at the campground office. We were able to spend the entire long weekend here, with yesterday and today in a semi-serviced site (no sewer). 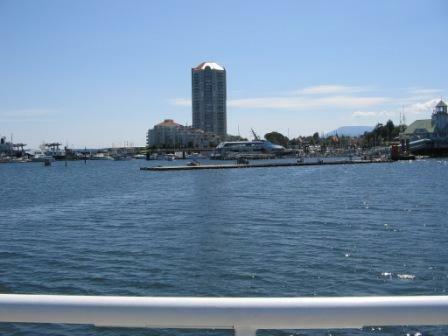 The city center of Nanaimo is located on a protected harbour area, with lots of walking paths and great scenery. There is a lot of activity in the harbour, seaplanes and ferries drop off passengers and vehicles, there are log booms offshore waiting to be processed at the mill south of Nanaimo. There are also some condos with great views of the harbour. 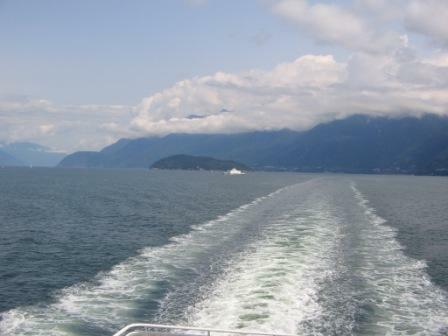 The ferry ride from the mainland was relatively quick at just under 2 hours. We have heard a lot of criticism of the ferry services out here, but our experience was that the service was efficient (we waited just over an hour to get on), the food on-board was excellent and the cost for our trip at about $150.00 was cheaper than comparable services in Ontario and in the Maritimes. The view wasn�t bad either! 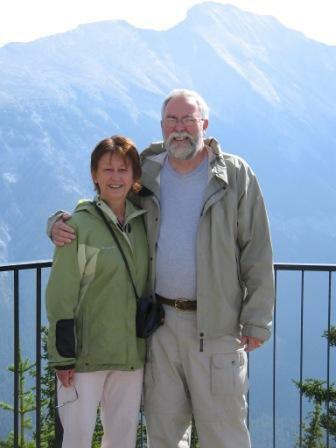 We toured around Whistler (and used the medical clinic, which was very efficient). 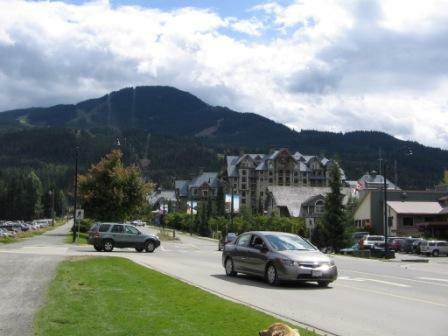 The area is truly a four seasons resort, we met a number of mountain bicyclists who indicated that Whistler has the best bike trails around, even better than in Washington state. The mountain bikers keep the medical center busy, one biker indicated that four ambulance calls were required on one trail in the early afternoon! 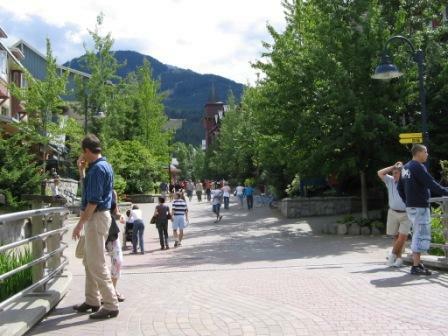 Whistler has a very nice walking only center with lots of stores and services. It feels like a modern version of a European city. There is also a lot of construction activity from Whistler down into Vancouver, in preparation for the 2010 Olympics. 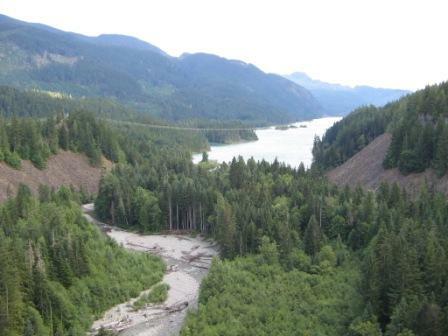 The road from Lillooet to Whistler is part of the Sea to Sky highway, highway 99. 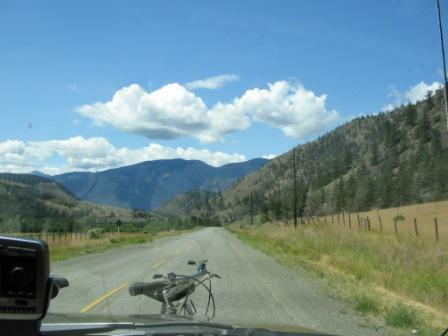 It has some interesting grades, 12 to 14% for a few kilometers at a time. I made the mistake of stopping on a hill to cool off the trailer brakes; I had to keep the brakes on to prevent rolling down the hill. As a result, I smoked the trailer brakes; the brakes still work OK, but probably will have to be replaced as I�m sure they are glazed or otherwise deformed. 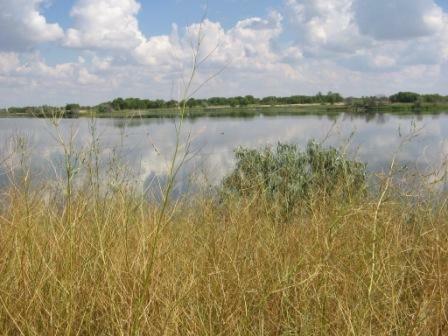 This town is very nice, it is located in an arid area, as can be seen from the pictures, even grass growing for hay has to be irrigated in order to grow. The climate is very temperate, little or no snow in the winter and temperatures just touching the freezing mark. It�s amazing how the climate varies over less than 100 km. in this province. 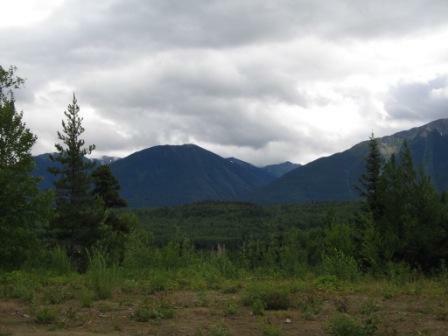 This was a one night stop south of Quesnel on the way to Lillooet. 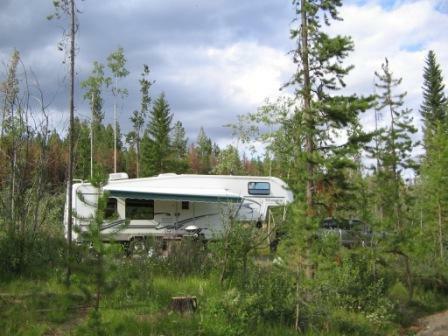 This was a good stop, we stayed here for 2 nights, we provisioned in Quesnel and got essential things done like haircuts etc. We stopped at this full service RV park to dump the tanks, fill with water and do some laundry. Having spent the last 3 days in provincial parks , we were out of fresh water (Suzette had a shower this morning, but I missed mine!). This park is interesting in that it is located right beside the Kitwanga river and has a native salmon enumeration facility located on the river. 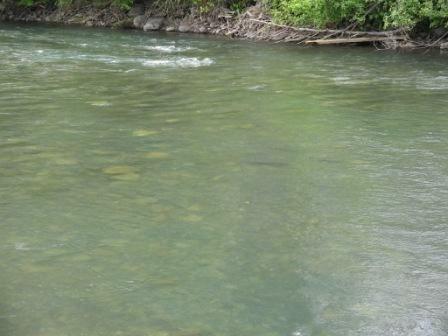 We saw some salmon in the river heading upstream to spawn, no counting was being done at the time we were there. 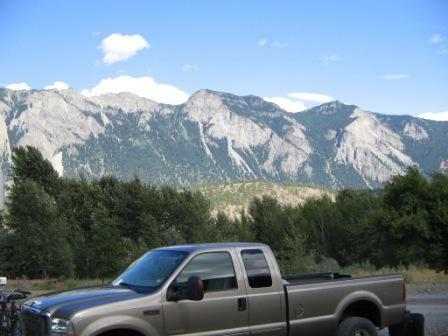 The campground has a great view of the mountains as well. 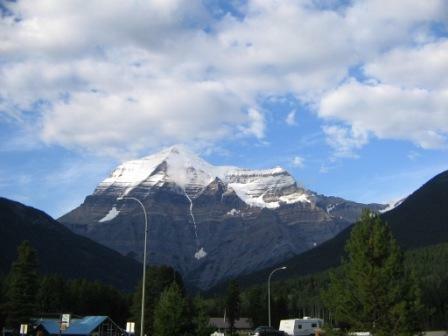 We spent 2 days at this provincial park and also took the opportunity to take the "glacier highway" to Stewart, then went into Alaska to see the Salmon glacier. This is the view from our campsite. The campsite we used was high up on the hill, we used 4 wheel drive low range on the truck (for the first time!) to back into the site. We are not sure why the glacier is called the Bear glacier, it may be because of the shape at the toe, We think it looks like the face of a bear! 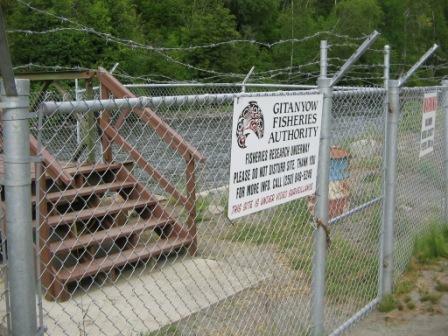 We crossed the border into Alaska and went to see the fish ladder display just outside Hyder, organized by the US forest service. 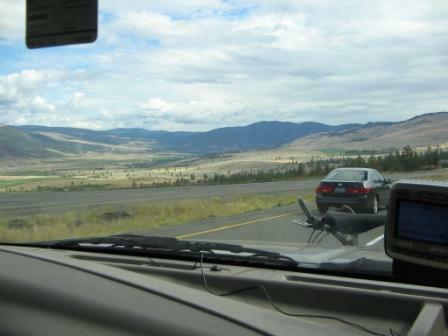 We returned back into BC, a little concerned because we did not bring passports. There is no US customs going into the US (you can't go anywhere, the road ends at the salmon glacier), but the Canadian Customs exists apparently for tobacco and alcohol monitoring (it's cheaper in the US). 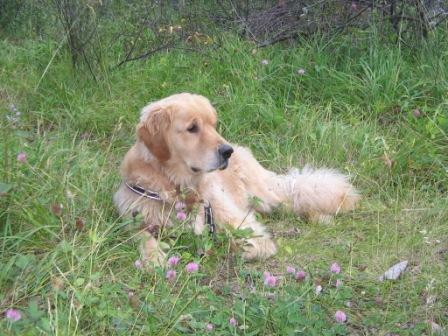 We were let back into our country without any hassles, and returned back to our campsite. 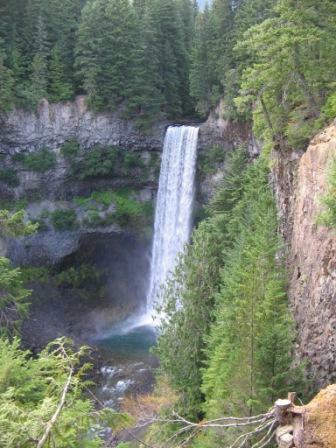 Another great BC provincial park! We got a site on the lake, with great views outside the back window of the RV. We made a one night stop at a full service RV park here in order to dump the tanks and fill up with water. Up north here in BC, the provincial parks generally don't have dump facilities. 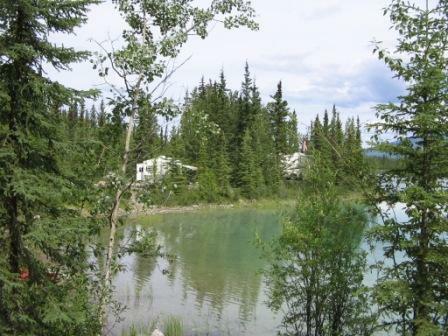 Another great campsite directly on the lake! There were a number of sites that backed out onto the lake, we got one that allowed us to inflate the boat right on the campsite. 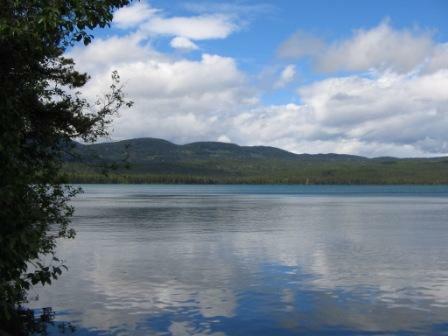 The lake is quite interesting, it has a couple of beaver ponds and many coves and islands. The water was almost still and great images of clouds and hills were seen.